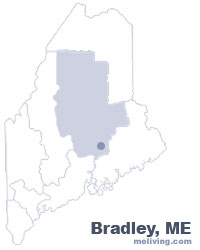 Bradley, Maine, part of the greater Bangor Metropolitan area, at one time was known for its 28 operating lumber and sawmills. The Maine Forest and Logging Museum located at Leonard Mills in Bradley, is a living account of Maine’s extensive history as the top lumber producer in the U.S.. Here volunteers take visitors back in time with period dress and demonstrations by various crafters and an operational sawmill. To share any Bradley, Maine information with us, please contact us. Learn more about advertising in MELiving.